After debuting in the first season for the Sydney Chiefs – who finished runners-up – he was one of the biggest names to change clubs in the offseason. We spoke with Doom, who is now the Brisbane Deceptors captain, about his decision to leave the Chiefs, as well as how he’s navigated a difficult Season 2. The Roar: When did you start playing CS:GO or Counter-Strike, and when did you start taking it a bit more seriously? Doom:	Well for Counter-Strike I started playing in… I think it was 2014. But my interest in esports was peaked first by DotA oddly enough. I played DotA for like, probably three years. I was studying genetics and psychology at the time, and I was watching this competition, and there was an interview with one of the Chinese teams about how they got there and stuff like that. They described basically that back in the day, they would go to LANs and stuff, they’d fully fund their own flights and they couldn’t afford accommodations, so they’d be sleeping on the LAN centre’s floors and, you know, that sort of thing. Doom: When he said, because he was Chinese, his parents disowned him when he said he wanted to be an esports athlete, I guess. Then now, or not now but then, they were in the front row and cheering him on. So I was like, “Oh.” I was like, “That’s really sweet.” You know like, I was like, “Oh, I want that,” you know? Doom: It kind of, I guess bore a realisation that I was just like, that would be what I want as my future, you know? The Roar: Yeah. I take it not necessarily getting disowned, but more a sort of future in esports. Doom: Yeah, yeah, well the future as a whole. You know playing on the big stage and making the big bucks. I guess seeing that they all had hard times, you know what I mean? The Roar: Yeah. For sure. Doom: They all pushed through it, and it was just like a battle of will. Then they got to the big stage. The Roar: Well just jumping a bit forward then, how did you get to be a part of the Gfinity Elite Series? You started last season with the Sydney Chiefs. Doom: Well, my teammate made me aware, Yetibacon made me aware of the series as a whole going on. He emphasised the importance to me of playing in the draft – the Challenger Series. So Gfinity held three tournaments a week, they were kind of like mini-tournaments, where it was an open registration, everyone could join. Tuesdays and Thursdays offered 1,000 points to the team who won, and then lesser amounts to teams who came second, third, fourth etc. Sundays offered 5,000 points to the team who won, and then 1,000 points to the team who came second, and so on. We played, well my team and I, sorry, played Sundays so we made it. We went out of our way to play every Sunday at this tournament for Gfinity. Then we made it into the draft, which was great – and then got picked up by the Chiefs. Doom: That team was third to seventh I think, on the level. Because the top 20 out of the draft made the Elite Series. team in the final. What was it like to be a part of that first season? Doom: It was good and exciting, but also somewhat underwhelming. Doom: In that I just didn’t fit with the Chiefs guys. It was just sort of… I mean, not necessarily a personality clash, we kind of just didn’t mesh. that sort of thing, it’s a big difference. Last season if we did have that team chemistry we would have done a lot better in the final against Order, than obviously going down 0-3. We could have actually had a chance. The Roar: Interesting. And I suppose, so then in that first season were you always hoping to move to Brisbane to play with Yetibacon again? Or was it something that came up more naturally? Doom: Um, from the first season, I suppose yes. Well, I wanted to play again. I wanted to play again on the stage, ’cause it’s always a bunch of fun. But yeah, I guess I did want to move to a team that was a bit more… not accommodating, but that would fit me a bit better. The Roar: Yeah, for sure. Doom: And Deceptors is obviously one of those teams. The Roar: Big time. Also I take it, a bit of the home town appeal as well, being from Queensland yourself? Doom: Oh yeah, well my mum gets really excited at home watching on the stream. At the stadium you get the, “Brisbane! Brisbane! Brisbane!” [chant], and my mum’s at home and chanting along with them. The Roar: That’s fantastic. That’s super cool. This season, obviously it’s been a bit tough. I think the Deceptors have been a lot more competitive than they were last year, but you still unfortunately are 0-4. How do you as a team, sort of each week, try to overcome that disappointment and just get ready for another crack at hopefully getting a win? Doom: Well, we know how close we are, you know. Our first three games we should have won, which is a thing that we keep in mind because we know we’re good enough to be able to make the grand finals, you know? We feel like we should have won the first three matches. We shouldn’t be 0-4, we should be 3-1. [Perth] Ground Zero was a very tough game, but, that’s how we sort of rationalise it and we sort of compartmentalise it into what mistakes were made, trying to fix them up and bring them into the next week. You try to fix, essentially, what’s happening, bring it into the next week and come back stronger, so you don’t dwell on the loss. The Roar: Just on that note, I was going to say, I have noticed in a lot of your matches, you’ve definitely had the ascendancy for stretches and the game has just gotten away from you. Sometimes, just very quickly, what do you attribute that to? Doom: Um, I think it’s hard to say, it’s very very hard to say what causes you to lose. The Roar: I can imagine. Doom: But I’d say it’s confidence in some faculty – including, sort of, the lack of confidence. There’s a bunch of different factors. So there’s the confidence when you’re going super high, you’re winning lots of rounds, and then you lose an eco, and then you’re like “ahhh,” and you just lose all your confidence. There’s people that zone in too hard to the game and they just get way too focused, so they’re focused on what they’re doing and they completely lose track of what’s happening around them, and they don’t have any room to think, you know what I mean? Also, some rounds [there’s] a lack of teamwork or people slipping up. So on man-advantage rounds we make it a very, very big point not to push, to let them come to us. But sometimes people, you know, it slips their mind, and they push, they give it up on a real important round, and it ends up losing us the round. That’s generally most of it. It’s mostly psychological, you know? It’s not necessarily, our mechanical skill is dipping, but it’s our mentality that kind of changes. 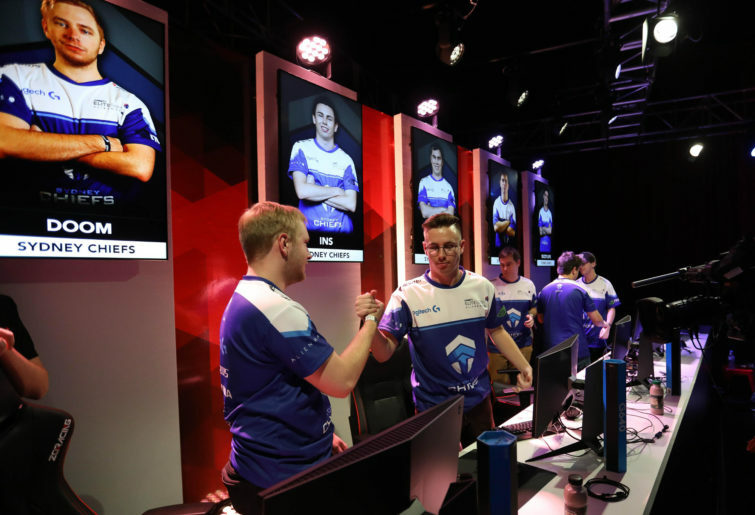 The Roar: Just on a more positive note to finish off, you’ve kind of touched on it before, you have kind of surprisingly been the most well-supported team at the Elite Series in Season 2 despite the fact that all the matches were being played in Sydney. Brisbane definitely have the most fans. How much of a difference does that positive crowd energy make when you’re on stage? Doom: Oh massively, it makes the experience just infinitely better. It’s incredible playing up there, being able to feel… like, you win a clutch and you can feel the crowd’s like, legs, you know what I mean? You feel them kicking the floor, it’s just incredible. You know, I imagine it would be like, IEM Sydney, or something like that. There’s only 50 people but it feels like there are a thousand. To play under that is encouraging, but at the same time I can see to my teammates it’s daunting because they don’t want to let anyone down.